About a third of UK homes have solid walls, according to the National Insulation Association and it estimates that around 45% of heat from these homes could be escaping through the walls. The Grinshill flats were originally built with solid concrete walls meaning the residents have struggled to keep the heat in their homes. At a time when fuel costs are continually rising, WHT sought to achieve a cost effective solution that would see the residents benefiting from reduced utility bills. Wetherby recognised installers: Sustainable Building Services (UK) and Hamilton Building Contractors were both awarded the works for the project. The project has seen each of the 5 blocks being re-roofed, new windows installed and EWI applied to the outside face. 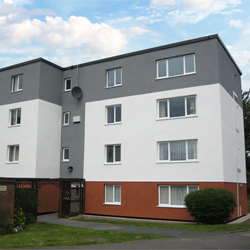 Based on the existing no fines concrete walls of Grinshill flats, Wetherby’s External Wall Insulation system was specified as the perfect solution. The EpsiTherm insulation consisted of a layer of graphite enhanced EPS insulation board using a thickness of 90mm. The inclusion of graphite ensures the product offers an enhanced thermal insulation material making it the ideal cost-effective insulation method. To complete the system two finishes were used; a brick effect render to the ground floor, followed by a decorative silicone 1.5mm ‘K’ render to the 1st, 2nd and 3rd floors in colours white and grey. The combination of the traditional and contemporary finishes has greatly improved the appearance of the flats, bringing them up to modern standards within the local community and fully meeting the expectations of the residents. On completion of the project the U-value has been improved from 1.74w/m²K to 0.30w/m²K meeting current building regulation requirements and meaning the residents could save as much as £145 per year on average benefiting from a warmer, weather resistant home.